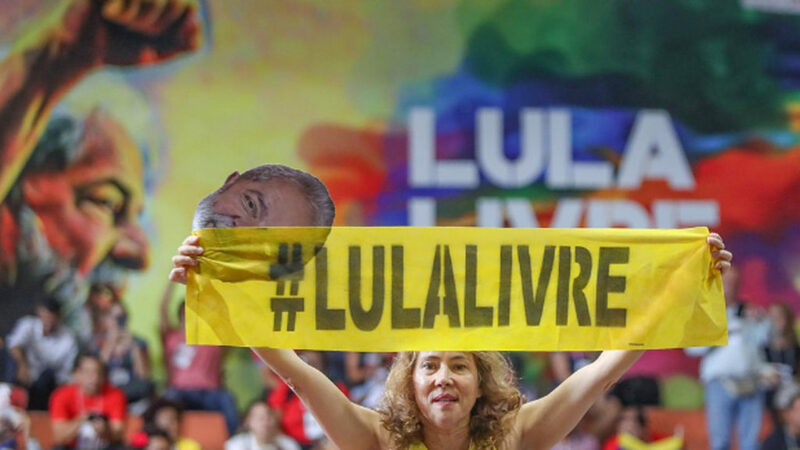 MIKE FOX: Social movements and left political parties met in Sao Paulo over the weekend to relaunch the campaign to free former President Luiz Inácio Lula da Silva. SPEAKER: It’s important to free Lula because he represents each and every one of us. He represents our victories. If he’s in jail, each of us are in jail. It means our rights are going down the drain. MIKE FOX: More than a thousand people attended the event. At the meeting they organized plans for a series of actions to coincide with the one year anniversary of Lula’s imprisonment on April 7. Under Lula’s presidency, millions were lifted out of poverty. He left office with an 87 percent approval rating. He’s still one of the country’s most popular leaders. But he was jailed last year after he was convicted of accepting a beachside apartment from a company seeking government contracts. Judges ruled against him in a second conviction earlier this year involving, this time, a country property an hour north of Sao Paulo. But his supporters and many legal experts say he’s innocent, and that the convictions were a means of blocking him from returning to power. They say Judge Sergio Moro was politically motivated. Moro has long held connections to the country’s right wing. He’s now President Jair Bolsonaro’s justice minister. SPEAKER: We in the Brazilian Association of Lawyers for Democracy have been following this case for a long time, from the very beginning, with lawyers from across the country, and we consider both rulings against the law to be complete judicial aberrations. There is no evidence against Lula. MIKE FOX: A Free Lula vigil has been ongoing outside the federal prison in Curitiba, where Lula has been held since last April. There are committees dedicated to fighting for Lula’s freedom in many cities. Those at the event called for the expansion of free Lula committees around the country. SPEAKER: It’s clear that we have to develop and root our organization with the Free Lula committees not only to defend President Lula’s innocence, but also to create a huge mass of activists to fight against the policies destroying the country that are being implemented right now. MIKE FOX: Those in attendance say Lula is a political prisoner. They vow not to stop until he is free.